Department of Correction Commissioner Joseph Ponte at the City Hall announcement of the plan to close Rikers Island in the next 10 years. 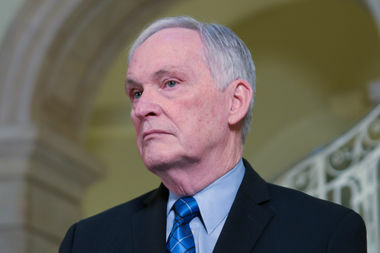 MIDTOWN — Embattled Department of Correction Commissioner Joseph Ponte resigned Friday amid the ongoing scandal into misuse of his taxpayer-funded city vehicle, he said. Ponte, who was appointed by Mayor Bill de Blasio three years ago to clean up problem-plagued Rikers Island, used his car for out-of-state trips, a strict violation of city policy, the Department of Investigation found. De Blasio has passionately defended Ponte, 70, since the DOI report was released last month, saying the commissioner merely "made a mistake." "There is no doubt that our city's jails are safer, more rehabilitative and more humane as a result of Commissioner Ponte's work," de Blasio said Friday. But critics said the commissioner’s decision showed poor judgment and called for his immediate resignation. Ponte said he was proud of the work he did as commissioner and hopes it continues without him. "I'm confident that all the hard work we've accomplished has positioned the department for even more meaningful reform in the days ahead," Ponte said. "It's truly been my honor to serve as commissioner of the New York City Department of Correction," he said. The DOI probe found Ponte logged more than 18,000 miles of out-of-state travel over roughly three months, mostly for trips to Maine. He also racked up more than $1,000 in out-of-state gas charges and nearly $750 in E-Z Pass expenses for non-city business trips, according to the DOI. Earlier in the week, Gregory Kuczinski, the DOC’s chief investigator, was partially relieved of duties after a bombshell DOI report revealed he used agency staff and technology to eavesdrop on conversations between the DOI and informants. The mayor reiterated his commitment to jail reform and said he'll seek a new dedicated to that mission. "I will be looking for the same experience and progressive commitment to smart, effective correctional policy that Commissioner Ponte's career has epitomized," de Blasio said.